The Philadelphia Museum of Art has acquired three important French Impressionist paintings by Claude Monet, Camille Pissarro, and Alfred Sisley, and a pastel by Mary Cassatt, the Pennsylvania native and American expatriate who became famously associated with Paris during the late 19th century. All of the works are gifts from Chara C. and the late John Haas, longtime supporters of the Museum. They include Path on the Island of Saint Martin, Vétheuil (1881) by Claude Monet (French, 1840-1926); Apple Tree in the Meadow, Éragny (1893) by Camille Pissaro (French, 1830-1903); Mooring Lines, the Effect of Snow at Saint Cloud (1879) by Alfred Sisley (French, 1839-1899); and Madame Bérard’s Baby in a Striped Armchair (1880-81) by Mary Cassatt (American, 1844-1926). Apple Tree in the Meadow, Éragny (1893) captures the fields and gardens around Camille Pissarro’s (French, 1830-1903) home in Éragny, a small village about 90 miles northwest of Paris. This focused study joins four other views of the Pissarro home in the Museum’s collection from earlier years. 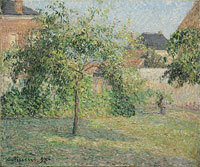 A view of the meadow adjacent to Pissarro’s house (the brick building visible on the left), it is marked by the strongly-patterned brush and palette knife work common in the artist’s paintings of the 1890s and clearly demonstrates the influence that the work of the Post-Impressionist painter Georges Seurat (French, 1859-1891) had on Pissarro’s work during this period. Alfred Sisley, an Impressionist landscape painter well represented in the Museum’s collection, painted Mooring Lines, the Effect of Snow at Saint Cloud (1879) while living to the west of Paris. Of particular note is Sisley’s dramatic treatment of the winter view in which the snowy river bank is animated by the mooring lines that secure an unseen barge to the bank of the river. Sisley was widely admired for his skillful renderings of winter scenes. Here the sky and the fugitive effects of light and weather are depicted here in nuanced tones of white and blue. Mary Cassatt achieved remarkable success as a woman working in a field almost entirely dominated by men. Several of her sensitive portraits depicting family scenes and her nieces and nephews are in the collection at the Museum, including Portrait of Alexander J. Cassatt and His Son, Robert Kelso Cassatt (1884) and A Woman and a Girl Driving (1881). 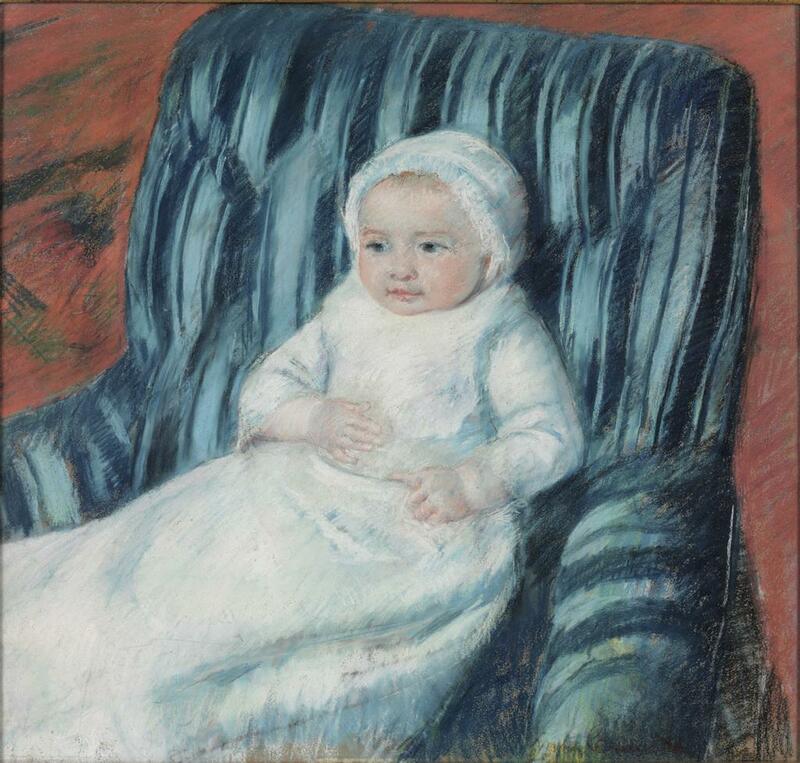 Madame Bérard’s Baby in a Striped Armchair, a portrait of 9-month-old Lucie seated on a vibrant blue striped chair, demonstrates the artist’s mastery of the pastel medium by the early 1880s. The brilliant use of red and blue in the background offsets the child, who is dressed in a formal white gown. Cassatt’s assured and sensitive handling of her young subject is particularly apparent in the modeling of Lucie’s moving hands. 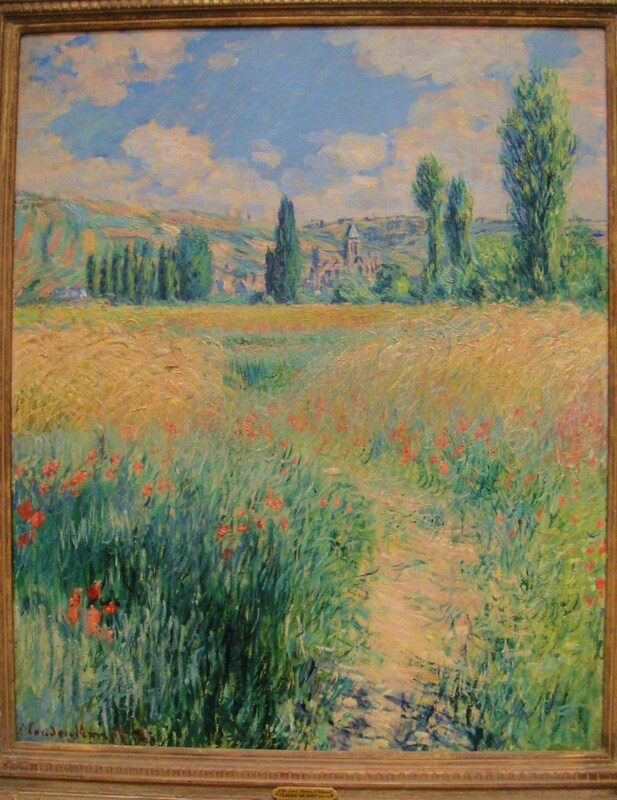 Monet’s Path on the Island of Saint Martin, Vétheuil (1881)is a colorful view of the fields near the village of Vétheuil on the north bank of the Seine, where Monet moved with his family in 1879. During the summer of 1881, Monet painted lush views of the town from the island of Saint Martin as his pictorial style evolved from the blunt, broad strokes of the 1870s to the delicate, rhythmic brushwork of Path on the Island of Saint Martin. This is the first work from Monet’s Vétheuil period to come into the Museum’s collection, and its presence will enable visitors to understand the development of the artist’s work during this important time in his career.